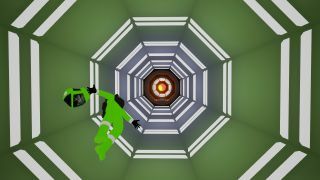 Last year National Insecurities, creator of Disorient on the Murder Express, released a game about a clumsy detective investigating space murders. It's called 2000:1: A Space Felony, somewhat confusingly. You're sent to a ship called the Endowment to figure out what's gone wrong, finding the bodies of astronauts and gathering evidence to present to an AI called MAL. It's a game of floating around in zero gravity taking snapshots while MAL says funny stuff, and it's pretty good. This week, to celebrate the annual German convention Gamescom, 2000:1 is free to download on itch.io. You can choose to make a donation if you feel guilty about getting it for free, and either way it's yours to keep forever.